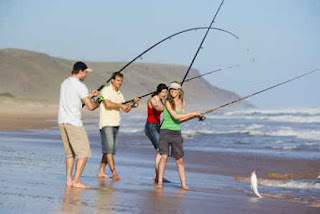 FishMax - THE Australian Online Fishing Magazine: Planning a Trip to South Australia to Fish? If you’re heading to South Australia to drop a line in, you’ll be sure to have a great time! From pristine beaches to the mighty Murray River, South Australia is an angler’s paradise. Adelaide's beaches offer some of the best fishing in South Australia, with whiting, snapper and garfish among the most common catches. Throw a line in at Aldinga for tommy ruffs or snapper then head north to Brighton for blue swimmer crabs. Fish off the jetty at Glenelg, Henley or Semaphore beaches and haul in squid, whiting, snapper and garfish. Port Augusta has some fantastic land-based fishing locations and is also a great place to find cheap hotel deals for your trip. 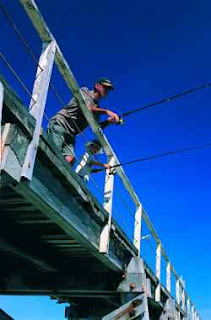 Around the train bridge there are good spots for silver whiting and mullet or try the main wharf for kingfish and mulloway. In Port Pirie, you can dangle a line from the main wharf right in the centre of town. This region has plentiful yellowfin whiting, salmon trout, bream, snook and garfish. Nearby, the Port Germein jetty is a good location for yellowfin, King George whiting and snapper..
For some fantastic fishing action from boat, shore or jetty head to the Yorke Peninsula. Try for snapper at Port Broughton and huge King George whiting off Port Victoria. In months when the water is warmer, blue swimmer crabs abound in this region. There are salmon fishing grounds from Corny Point to Marion Bay, and be sure to give surf fishing for salmon a go at Brown's Beach. Garfish, tommy ruffs, squid and snook are also common catches along this coastline. There are several excellent fishing charter operators on Yorke Peninsula for deep sea fishing adventures. Be sure to grab a copy of the free Yorke Peninsula Fishing Guide which covers more than 700 kilometres of coastline from Port Gawler to Port Broughton.